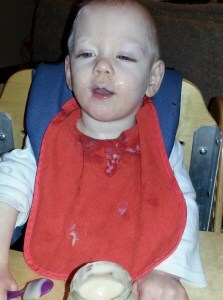 Home > Gavin > Pre-cursor to a milestone: self feeding! As easy going as he is, when it comes time to eat, Gavin can get be a little difficult. We try different foods, textures, flavor combinations, etc. but it doesn’t matter. Sometimes he just doesn’t want to cooperate. We encourage him to hold his spoon or nuke when we feed him so he gets the feel for what we’re doing. Last night not only did he hold his spoon but after I helped him to get the strawberry-banana puree onto his spoon, he tried to feed himself. With a little added physical support under his arm, he actually DID feed himself! To top it off not once did he fussy, gag, cry, spit food out or try to make things difficult. The exact opposite actually. He was smiling, laughing and in a great mood. For once, HE had control over what was happening. HE determined if he wanted more and only needed my help to keep his elbow level. But he ate an entire jar of stage 3 food! He even stayed pretty clean – cleaner than when some of the adults in his life try to feed him that’s for sure!! Looking for a way to help? We need recipes! I know – what recipe don’t I have?! But here’s the thing. Most of my recipes are healthy. Gavin is on a high fat/calorie diet. Kids with CP tend to burn through calories VERY quickly and if they don’t have enough to replenish what they are burning, they don’t grow. So here are some stipulations on recipes, first being that for the most part, foods need to be thicker purees or more “Stage 3” baby food (so some chunks). Next Post: New Year – New Devices!